~News (3/7): I got a Site of the Week award from http://www.lordofthepiggys.com. Thank you! ~Updates (2/18): One new affiliate added. Sorry updates are slow... working two jobs kinda keeps one from doing much of anything else. I do still have lots saved up to finish, and it will happen in time. ~Updates (2/13): Two new pieces of fan art have been added. ~Updates (2/10): I've updated the "links" section, which involved adding new links, and removing broken ones. I'd still love links submissions, so email me if you'd like me to link to your site. When I have time I look around the web for links, but time has been short lately as I've taken up a second job. ~Updates (1/29): A new piece of fan art has been added, and I've also added 73 more LJ icons by arwen_elvenfair. Also, I'd like to thank Arwen-Undomiel.com for making Lady of Rohan their site of the week! Thank you! ~Updates (1/27): Fixed the broken links in "fiction" and "analysis." They should all be working now. ~Updates (1/23): Added a new section in "conventions" for the recent ROTK EE showing I attended. I also have a new link for music videos in "videos," I've updated the section for the green gown in "costumes," and I have one new affiliate! ~Updates (1/17): Added another page and 1/2 to the "merchandise" section, and I still don't have everything covered. There are now six total pages over in merchandise. ~Updates (1/12/05): I've added three new LJ icons by Simbelmyne, and I have new LJ icon submissions by arwen_elvenfair. There are currently 50 of her icons on the "LJ" page, and there will be many more where those came from. Enjoy! ~News (1/6/05): Exciting news! I got in contact with Alan Lee, and I should soon have his artwork on this site. Thank you to AZ Tel and John Howe for helping make this happen! Also, I should have a new section up in "conventions" soon, because I just went to a charity screening for the ROTK EE. It was a blast! 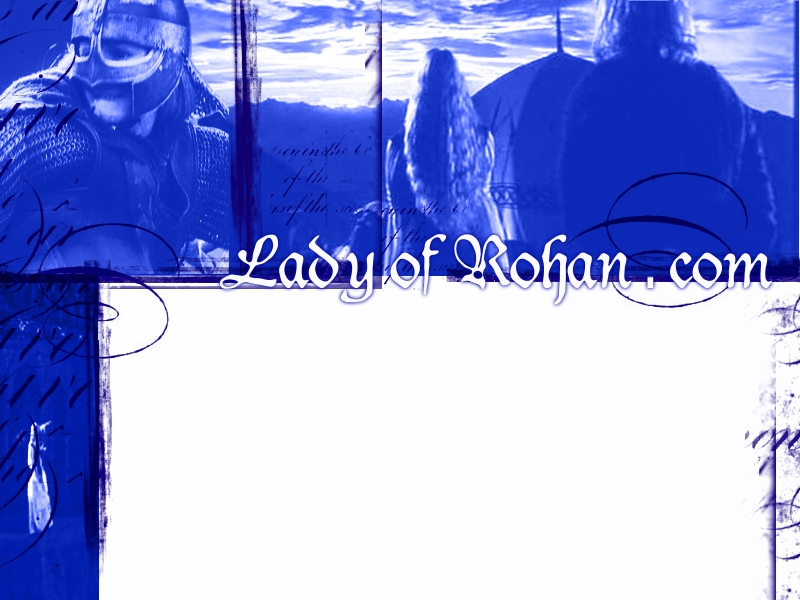 Also, Lady of Rohan just got made Site of the Month over at http://www.patriciakumbakisaka.cjb.net/. Thank you! Lastly, I have a new affiliate, Fate of the Ring. ~Updates (12/31/04): Happy New Year (almost)! I've added two new wallpapers, both made by myself. Enjoy! More updates to come... I still have more submissions that need to be added. ~Updates (12/25): Merry Christmas!!! I have added a bunch of new music clips, and I have also added extended edition quotes for both TTT and ROTK. ~News (12/23): Sideshow Toy is having a great sale on both it's Golden Hall and Helm's Deep environments. Only $75 each! That's a bargain! So, if you've been waiting, now is the time to order! ~Updates (12/23): A new wallpaper by DJB has been added, as well as a link to a new music videos site in "videos," and even more ROTK images. ~Updates (12/20): 2 new affiliates added. I should be getting more of the submissions up now that I'm not needed for teaching for a while. So, I'm hoping you'll get lots of new stuff to look at soon. ~Updates (12/11): Lots of new images in the ROTK gallery. ~Updates (12/10): One new affiliate added, Brave Eowyn. ~News (12/8): Lady of Rohan won an ACA Award for Best Character Site. Thank you! Also, I have a bunch of stuff to add, and it will be added as soon as my life gives me time to do so. Until then... cheers! ~Updates (12/2): Added 1 new wallpaper by Eowynangel, and some news images have been added to the ROTK Gallery. ~Updates (11/25): HAPPY THANKSGIVING! I've completed the Refugee Coat section over in "Costumes", and I've added many more fan costumes and tutorials to all of the completed costume sections. Enjoy! ~Updates (11/17): Added 1 new fan fiction by Pirate Fairy. ~Updates (11/9): Added 3 new gorgeous pieces of art! 2 new ones by Mael and 1 new on my M.W. Kaulta. Check them out in "Art"! I also added a new ROTK pic into the gallery. ~Updates (11/3): Added 6 new LJ icons by Simbelmyne. ~Updates (11/2): One new affiliate added, The White Shieldmaiden. ~Updates (11/1): I've added 3 new pieces of fan art. 2 are by myself, and the other is by Ginawyn. I've also added 6 new wallpapers, all made by Arwen of Arwen-Undomiel.com. Thanks! ~News (11/1): Happy November! Wow... already. The Gathering of the Fellowship convention journal is still looking for submissions. Please go to their website for more information. Your submissions are greatly appreciated. Thanks! ~Updates (10/30): Added some new LJ icons by twistedsoul_org! Thanks for submitting! I also added a new arrangement in "sounds" and updated some affiliated links. I also got another award! Thank you so much! ~Updates (10/29): Some Houses of Healing photos have been added to the ROTK gallery. I also made some icons from them which you'll find under "LJ" for Tigerlily Gamgee. ~Updates (10/25): 7 LJ icons by Simbelmyne added. ~Updates (10/24): Added some new fan costume pictures and tutorials for the White Wool Gown, Refugee Gown, and Shieldmaiden Gown. Thanks, ladies! ~Updates (10/22): Added some new AIM icons made by Arwen of Arwen-Undomiel.com. You can find them under "icons." ~News (10/22): I just had to share... I got sent photos of the Green Gown that I had made for me. Click here to see it!. I'll put pictures of me in it in the "costumes" section when I get the dress and get around to taking pictures in it. ~Updates (10/18): Four more Eowyn and Faramir photos added. See link in previous post! ~News (10/7): I spent some time today changing all of the Sideshow Toy banners... they have updated their software, therefore I had to update all of the links. Remember, if you click one of the Sideshow links on this site and purchase an item from that click LadyofRohan.com will receive a commission. This will help keep this site up. So, next time you are going to order from Sideshow, click from here first. Thanks! I have also added one new affiliate! ~News (10/4): LadyofRohan.com won two more awards! Check out my Awards Page. Thank you! Also, sorry updates have been slow... I have a bunch of stuff to be added, but my life has picked up in pace and I haven't had much time for the internet at all lately. Updates will be coming, though. In sad news, Miranda Otto had to cancel her Collectormania appearance, but it was because of an upcoming movie job... so that is excellent news for her. ~Updates (9/27): A bunch of new LJ icons by Julie's Icons, Itsapezwitch, and Amea have been added. ~Updates (9/26): One new affiliate added, and one old one was deleted because the link was broken. ~News (9/20): The Gathering of the Fellowship is pleased to introduce "In Fellowship," the journal of the Gathering, and we would like you to be involved! "In Fellowship" is accepting any and all articles AND artwork meeting their requirements. If you have any questions, please contact Stephanie (creative submissions) or Melly (general submissions) at the email addresses listed above. ~Updates (9/19): One new affiliate added, The Archives of Middle-earth. ~Updates (9/16): One new affiliate added, Admired Miranda. ~News (9/10): One new award from the Simbelmyne Awards. Thank you! ~Updates (9/9): A whole new section has been added to the site. Go check out "Conventions." ~News (9/8): Miranda Otto has been scheduled as a guest at Collectormania 6. You can visit their website HERE (though last I checked they don't have her up on the guest list yet). ~Updates (9/5): Finished the "white gown" and "refugee gown" sections over in "Costumes." I also added a few new fan costume pictures in the "shieldmaiden gown" section. I'm still looking for more fan costume pictures and tutorial sites... send them on in! ~News (9/5): Two more Awards!!!! *cheers* These come from the Shieldmaiden of Rohan Awards. I won for "best character related site" and "manager's favorite site." Thank you!!! Also, if you haven't yet, please vote for me in the Vanimelda Voter's Choice Awards by going HERE. ~Updates (9/3): 1 new story in "Fiction," 2 new fan photos in the Shieldmaiden gown section of "Costumes," and a few new gallery pictures added. I am still waiting to collect more photos of fan costumes before I go furthre ahead with the costuming section... so send them on in if you have any. ~Updates (8/31): New affiliate: The Power of the Ring. Over 50 new images added to the ROTK image gallery. Screenshots come compliments of Beizy. Thanks Beizy!!!! ~News (8/30): Happy Birthday to Daddy Tigerlily. Yup, it's my daddy's birthday! In other news... my website has been honored with another award. Check out my Awards Page. ~Updates (8/25): Added 30 new LJ icons made by myself, Tigerlily Gamgee. Check them out! Lots of ROTK screencaps to come, compliments of Beizy. ~Updates (8/19): A new piece by Sharon Tanhueco has been added in "Art." ~Updates (8/18): The new arrangement of "Eowyn's Theme" by gkgyver is up. The version playing on the main page is edited for loading purposes, but the whole piece can be downloaded in "Sounds." ~Updates (8/17): Well, I just got back from a jam packed weekend that included going to the Wizard World convention in Chicago... that was quite a ride! Anyway, LadyofRohan.com has won another award, and this one was quite a surprise because I was up against so many other great sites. Check out my Awards page. This one comes from the Starlit Seas Awards. Thanks so much! I will soon have the Eowyn theme playing on the main page of this site, gkgyver is arranging it for me :) Thanks gkgyver! I also have two new affiliates... check them out! ~Updates (8/9): One new affiliate added. One new Eowyn link added. Two new items added under "Rohan History." Updates have been slow because I've been working many 12 hour days... yikes! ~Updates (8/3): I changed the format of the LJ icons page so that it will load more quickly. Each creator now has a link to their own individual icon page. I've also added 8 new icons by Itsapezwitch. ~News (7/28): LadyofRohan.com won an award from the Vanimelda Awards for best character devotion. Thank you! ~Updates (7/26): I added a whole new page to the "merchandise" section. There sure is a lot of Eowyn stuff out there when you really look for it. I also put up two new LJ icons by Lothiriel/shieldmaiden, and I archived some of the news from this page. The biggest news, though... Click here to see some ROTK EE screencaps from the Comicon preview. ~News (7/24): Sideshow Collectables has posted pictures of their Eowyn/Dernhelm statue online! GO TAKE A LOOK at this gorgeous, and extremely detailed, statue!. Remember, it is currently sold out on their website, but you can sign onto a waiting list for the statue. ~News (7/22): According to the latest Sideshow Affiliate newsletter... the Eowyn statue is going to be unveiled at Comicon this Friday. So that means that we'll get pictures of it on the website soon! Also, please help out LadyofRohan.com by connecting to Sideshow Collectables via the link buttons throughout the pages of the site. Thank you! ~News (7/21): The ROTK Toybiz Coronation Gift Set is in stores now. This set contains an Eowyn in her golden coronation dress and Faramir in his coronation Gondorian armor. Get yours today! These can usually be found at Toys R Us... they are the only one who I know to carry the large gift sets. ~Updates (7/21): I added 5 new affiliates and there are 3 new icons by Lothiriel/shieldmaiden in the LJ icons section. PS - if you haven't checked out the messageboards then please do! We've got a lovely little community started there and we'd love to have you join us! ~Updates (7/12): Ok, I guess I lied about no updates for a week :) I added a ton of stuff today... there are a bunch of new ROTK sound clips under "Sounds" and I added a bunch of ROTK movie clips under "Video." Enjoy! Aragorn's Coronation Shirt (1:663), Arwen's Coronation Dress (1:265), Elrond's Bronze Silk Robe (1:480), Eowyn's Coronation Dress (1:300), Eowyn's Golden Hall Party Dress (1:438), Frodo's Grey Havens Vest (1:870), Merry's Rohan Cloak (1:266), Sam's Wedding Jacket (1:257), the Witch-king's Cloak (1:243). Look's like there is pretty good odds of getting some Rohan related piece. We also see the official name for Eowyn's blue victory gown. Now if only we'd get better pictures of it :) Well, with the addition of these and even more that I have compiled, it looks like the merchandise section will be expanding even more very soon! Keep on coming back, because there's so much I have to add, but it has to be done in small sections because of time. I'm off to the Bristol Faire this weekend, so no updates for probably a week or so. ~Updates (7/5): Added even more music video links, and I also added a new sound clip under "Sounds." I also reworked the "links" section and added a few new ones. Lastly, I added a whole new page under "Merchandise." ~Updates (6/28): Added links to great fan made music videos under "Video". 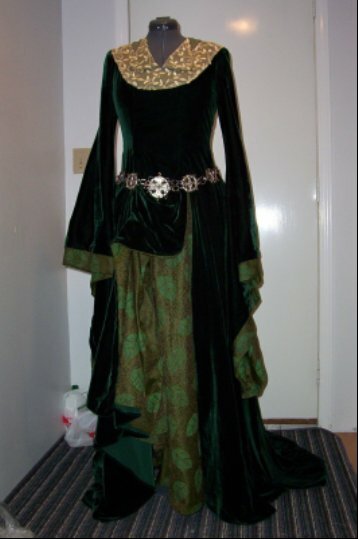 Completed the sections for the Shieldmaiden gown and the Green Gown in "Costumes". I am still looking for submissions for the costumes section, so if you have a picture of yourself dressed as Eowyn or a tutorial site, please email me at Tigeowyn@hotmail.com. ~Updates (6/26): The Family Tree has been completed. Go take a look over in "History"
~Updates (6/25): Added an LJ Mood Icon theme that I've created. Check it out here. It will remain listed under "icons". ~Updates (6/6): 8 new AIM icons added, a new updated version of "Charge of the Rohirrim" has been added under Sounds, and I am still working on getting the costumes section up... so send in your photos! ~News (5/27): Sideshow reports: "The Golden Hall environment is selling very well since we posted the Quicktime feature on our site. Provide a link for your LOTR fanatics"
~Updates (5/27): many new ROTK images added. ~Updates (5/13): "Shadowfax" added in Sounds. ~News (5/12): The �owyn statue from Sideshow Weta is sold out and retired! Don't fear yet, though, because they have a waiting list that you can sign up on in case any of the pieces become available. So, head on over to Sideshow Toy to get a spot if you missed out on this figure. Who'd have thought it would sell out before the image has even been released!? ~Updates (5/12): Two new pieces by John Stewart added in Fan Art. Check out his website for a huge array of LOTR work. All of it is fantastic! I also finished up the ROTK Quote section... all of the book quotes are now included.